My old dovetail saw gave up the ghost in the middle of building a toolbox for the side of my bench. The saw was one of those reversible types with a spring-loaded pin; the pin no longer held and was releasing in the middle of cuts. So I headed to the store to try to find a replacement. Rather than buy the same type of saw, I wanted to find a saw that was made for finer work. I spotted Irwin’s dovetail pull saw and figured I could hardly go wrong for $10. Even thought Irwin uses the word dovetail in the name, they don’t include cutting dovetails in their product description. What they do say is they designed it primarily for flush cutting dowels and “any detail cut.” Then they give examples of people who would use the saw: an interior trim contractor or a fine woodworker. While the saw works well, there are a few reasons why this probably isn’t your go-to saw for fine woodworking. Reason 1: there’s a little bit of play between the handle and the blade — it doesn’t detract much from the saw, but it’s not the sign of a quality tool, either. The reason the play exists is because Irwin designed the saw to use replaceable blades. To remove the blade, just press the blue button on the handle and the blade pops out. Some reviewers note that there’s no replacement blade available anyway, so the decision to make the blade replaceable doesn’t make any sense. Were they originally planning on selling a $7 replacement blade for a $10 saw? Reason 2: Building the toolbox, I gave the saw a pretty fair workout. The original project plan didn’t call for dovetails, but since I had been experimenting with hand-cut dovetails, I though this would be a good project to practice my techniques. While the flexibility of the saw comes in handy for sawing flush cutting, it is actually a liability for cutting dovetails. The thin blade doesn’t have enough backbone to adjust the angle of the cut once it’s been started, so you need to be careful to start the cut correctly. Besides these minor complaints, I find the saw really handy. The kerf is thin, and the teeth, while fine, are fairly aggressive. Whether it’s aspen or oak, this saw makes sawing through most woods almost effortless and it leaves a smooth cut with little tearout. I’m starting to see why Japanese pull saws are all the rage. It had gotten to the point where I’d rather have spent five minutes trying to figure out how to use a power tool than fight with a push saw. In contrast, sawing with a pull saw, at least this pull saw, is almost pure pleasure. You almost go looking for reasons to use it. The Irwin saw is so easy to use, I found that it’s the perfect saw for my 6-year-old daughter to use while she’s in my shop. It’s very light, it cuts with hardly any effort, and it’s much easier for her to control it since it cuts on the pull stroke. She loves using the saw to reduce scraps of wood into even smaller scraps and sawdust. In case you’re wondering what the toolbox looks like completed, here’s a picture of it hanging off my workbench. It looks like you can purchase this saw online for around $12 to $15, but I found it locally for $10. Since I liked this saw so much, I think I’m going to try its bigger brother: Irwin’s Extra Fine Cut Saw. It’s has almost exactly the same teeth, but it’s a little thicker and should be a little stiffer, which would make it better for cutting dovetails. thanks for the review. I tried using their ryoba knockoff for dovetails and it was a little crude – for the most part because of the flexibility and critical nature of kerf-starting that you mention. I saw this saw and thought the same thing, then wondered about the larger version you link to. if you give that one a shot, definitely post a review and let us know how it works out for true dovetails! I reach for my thin kerf pull saw way more than I thought I would, though I agree about the importance of starting the cut correctly. Very cool that you’ve got your six year old helping you. Even cooler that she’s wearing eye protection. Very cute pic of your daughter. Spend a little more and get a really good pull stroke saw at The Japanese Woodworker. They have a wide array of reasonably priced, high quality pull stroke saws, including some saws that are excellent for cutting dovetails (a steel spine too keep the saw straight when cutting on an angle). And most of these saws have replaceable blades, and you can get them right from The Japanese Woodworker. No, I don’t have any financial interest in the site…just a satisfied customer for many many years. I use mine to make the final cut when parting off at the lathe. Lathe stopped, of course. Find it too flimsy for much else. +1 on cute pic of your daughter. I’m also glad to see the safety glasses. 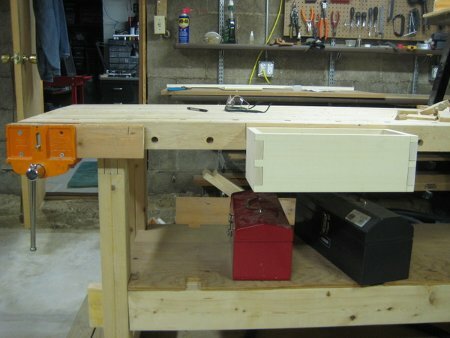 But have found that it works better for me if I hold the work below waist level – rather than up in a bench vise. In our cabinet shop – we create dovetails via machinery – but at home I do more and more hand work with sharp chisels and saw. Its worth taking the time to learn how to cut precisely to a line with both a good quality western or pull saw. I have had one of these saws for about three years now and find that I use it very often. It cuts quickly and cleanly and is just a handy tool to have. I absolutely cannot cut a straight, plumb, square line with a standard push-style saw but find I come much closer with this pull saw. I haven’t noticed any play in mine. I have one of these saws (Shark brand, but otherwise apparently identical). It’s OK for flush-cutting and small trimming tasks, and I use it a fair amount, but it’s really NOT a dovetail saw. The teeth on these saws are shaped for crosscutting, and dovetails are primarily rip cuts. If you’re serious about hand-cutting good dovetails, I highly recommend you try a REAL dovetail saw – with that and a little practice, the difference will be night and day. Lee Valley/Veritas has about the cheapest GOOD dovetail saw I’ve ever used (it’s around $60), but I guarantee that if you give it a chance you’ll be cutting better dovetails, faster, than you ever could with this shark/irwin crosscut saw. Japanese/pull-style dovetail saws, with real rip teeth, are also available, but almost certainly not at your local home center. (The rip-tooth side of a Japanese Ryoba saw is probably too coarse for most furniture-scale dovetails, but it is still an improvement over these tiny crosscut teeth, in my opinion). I heartily applaud your dovetail practice – that’s the only way to get good at it! I’ve seen some really crappy dovetails cut by $300 saws. 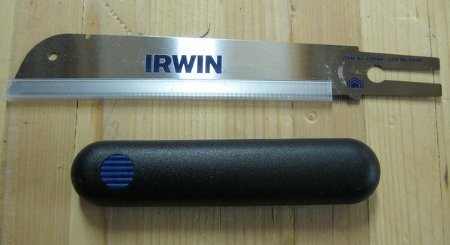 So if this Irwin/Shark is the only saw you can afford, by all means keep cutting dovetails with it – and when you can upgrade to something more purpose-built, you’ll appreciate it all the more! I’m a model maker and find this saw invaluable. I’ve had it for a couple years and reach for it frequently. Mine doesn’t have the problem with the blade slipping in the handle. It may be worth checking them at the store before buying. I used a lot of razor saws from Xacto and went to Zona. Neither brand cut harder woods efficiently. 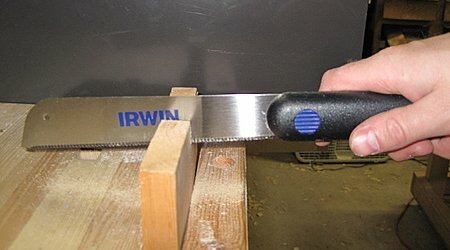 The Irwin has a thin kerf like the razor saws but cuts much more aggressively yet leaves a smooth cut. I can also use it in a micro size miter box because of the thin kerf of the blade. I will be replacing it when the teeth get dull. Worth it for small parts. I like this Saw, But the flimsy is the only thing i worry about. I have the exact same one. I put 1 strip of blue tape on one side of mine because the teeth do protrude to the side a little. The side that the tape is on is the side I face down when flush cutting something. It ensures that there aren’t little marks left all over my piece from the saw.